Electronic cigarettes (also known as e-cigarettes) are generally recognized as a safer alternative to combusted tobacco products (reviewed in ), but there are conflicting claims about the degree to which these products warrant concern for the health of the vapers (e-cigarette users). A vaper inhales aerosol generated during heating of liquid contained in the e-cigarette. The technology and patterns of use are summarized by Etter , though there is doubt about how current, complete and accurate this information is. Rather conclusive evidence has been amassed to date on comparison of the chemistry of aerosol generated by electronic cigarettes to cigarette smoke [2–8]. However, it is meaningful to consider the question of whether aerosol generated by electronic cigarettes would warrant health concerns on its own, in part because vapers will include persons who would not have been smokers and for whom the question of harm reduction from smoking is therefore not relevant, and perhaps more importantly, simply because there is value in minimizing the harm of those practicing harm reduction. The only exception to this methodology was when assessing a study of aerosol emitted by 5 vapers in a 60 m3 room over 5 hours that seemed to be a sufficient approximation of worst-case “bystander” exposure . All calculated concentrations were expressed as the most stringent (lowest) TLV for a specific compound (i.e. assuming the most toxic form if analytical report is ambiguous) and expressed as “percent of TLV”. Considering that all the above calculations are approximate and reflecting that exposures in occupational and general environment can easily vary by a factor of 10 around the mean, we added a 10-fold safety factor to the “percent of TLV” calculation. This safety factor accounts for considerable uncertainty about the actual number and volume of puffs since the number of puffs is hard to estimate accurately with reports as high as 700 puffs per day . Details of all calculations are provided in an Excel spreadsheet (see Additional file 3). Comparison to cigarette smoke was not performed here because the fact that e-cigarette aerosol is at least orders of magnitude less contaminated by toxic compounds is uncontroversial [2–8]. In excess of 9,000 determinations of single chemicals (and rarely, mixtures) were reported in reviewed articles and reports, typically with multiple compounds per electronic cigarette tested [2–8, 15–43]. Although the quality of reports is highly variable, if one assumes that each report contains some information, this asserts that quite a bit is known about composition of e-cigarette liquids and aerosols. The only report that was excluded from consideration was work of McAuley et al. because of clear evidence of cross-contamination – admitted to by the authors – with cigarette smoke and, possibly, reagents. The results pertaining to non-detection of tobacco-specific nitrosamines (TSNAs) are potentially trustworthy, but those related to polycyclic aromatic hydrocarbons (PAH) are not since it is incredible that cigarette smoke would contain fewer PAHs, which arise from incomplete combustion of organic matter, than aerosol of e-cigarettes that do not burn organic matter . In fairness to the authors of that study, similar problems may have occurred in other studies but were simply not reported, but it is impossible to include a paper in a review once it is known for certain that its quantitative results are not trustworthy. When in doubt, we erred on the side of trusting that proper quality controls were in place, a practice that is likely to increase appearance of atypical or erroneous results in this review. From this perspective, assessment of concordance among independent reports gains higher importance than usual since it is unlikely that two experiments would be flawed in the same exact manner (though of course this cannot be assured). Illustrating the difference between concentrations in the aerosol generated by vaping and inhaled air in a day. Panel Ashows a black square that represents aerosol contaminated by some compound as it would be measured by a “smoking machine” and extrapolated to dosage from vaping in one day. This black square is located inside the white square that represents total uncontaminated air that is inhaled in a day by a vaper. The relative sizes of the two squares are exaggerated as the volume of aerosol generated in vaping relative to inhaled air is much smaller than is illustrated in the figure. Panel Bshows how exposure from contaminated air (black dots) is diluted over a day for appropriate comparison to occupational exposure limits that are expressed in terms of “time-weighted average” or average contamination over time rather than as instantaneous exposures. 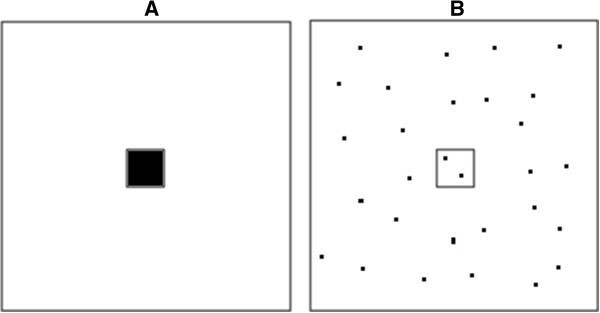 Exposure during vaping occurs in a dynamic process where the atmosphere inhaled by the vaper alternates between the smaller black and larger white squares in Panel A. Thus, the concentration of contaminants that a vaper is exposed to over a day is much smaller than that which is measured in the aerosol (and routinely improperly cited as reason for concern about “high” exposures). The same risk assessment considerations that exist for PAH also hold for carcinogenic tobacco-specific nitrosamines (TSNAs)  for which no occupational exposure limits exist because (a) these exposures do not appear to occur in occupational settings often enough to warrant development of TLVs, and (b) it is currently accepted in establishing TLVs that carcinogens do not have minimal thresholds of toxicity. As expected, because the TSNAs are contaminants of nicotine from tobacco leaf, there is also evidence of association between nicotine content of the liquid and TSNA concentrations, with reported concentrations <5 ng/cartridge tested . Smaller studies of TSNA content in liquids are variable, with some not reporting any detectable levels [18, 33, 35] and others clearly identifying these compounds in the liquids when controlling for background contamination (n = 9) . Analyses of aerosols indicate that TSNAs are present in amounts that can results in doses of < ng/day [5, 33] to μg/day  (assuming 150 puffs/day) (see also ). The most comprehensive survey of TSNA content of 105 samples of liquids from 11 manufactures indicates that almost all tested liquids (>90%) contained TSNAs in μg/L quantities . This is roughly equivalent to 1/1000 of the concentration of TSNAs in modern smokeless tobacco products (like snus), which are in the ppm range . For example, 10 μg/L (0.01 ppm) of total TSNA in liquid  can translate to a daily dose of 0.025–0.05 μg from vaping (worst case assumption of 5 ml liquid/day); if 15 g of snus is consumed a day  with 1 ppm of TSNAs  and half of it were absorbed, then the daily dose is estimated to be 7.5 μg, which is 150–300 times that due to the worst case of exposure from vaping. Various assumptions about absorption of TSNAs alter the result of this calculation by a factor that is dwarfed in magnitude compared to that arising from differences considered above. This is reassuring because smokeless tobacco products, such as snus, pose negligible cancer risk , certainly orders of magnitude smaller than smoking (if one considers the chemistry of the products alone). In general, it appears that the cautious approach in face of variability and paucity of data is to seek better understanding of the predictors of presence of TSNA in liquids and aerosols so that measures for minimizing exposure to TSNAs from aerosols can be devised. This can include considering better control by manufactures who extract the nicotine from tobacco leaf. Diethylene glycol and ethylene glycol became a concern following the report of their detection by FDA , but these compounds are not detected in the majority of tests performed to date [3, 15, 17, 19, 23]. Ten batches of the liquid tested by their manufacture did not report any diethylene glycol above 0.05% of the liquid . Methods used to detect diethylene glycol appear to be adequate to be informative and capable of detecting the compound in quantities < <1% of TLV [15, 17, 23]. Comparison to TLV is based on a worst case calculation analogous to the one performed for propylene glycol. For diethylene glycol, TLV of 10 mg/m3 is applicable (as in the case of all aerosols with no know toxicity by inhalation), and there is a recent review of regulations of this compound conducted for the Dutch government by the Health Council of the Netherlands (jurisdiction with some of the most strict occupational exposure limits) that recommended OEL of 70 mg/m3 and noted lack of evidence for toxicity following inhalation [http://www.gezondheidsraad.nl/sites/default/files/200703OSH.pdf; accessed July 29; 2013]. In conclusion, even the quantities detected in the single FDA result were of little concern, amounting to less than 1% of TLV. The frequently stated concern about contamination of the liquid by a nontrivial quantity of ethylene glycol or diethylene glycol remains based on a single sample of an early-technology product (and even this did not rise to the level of health concern) and has not been replicated. aAtmosphere that contains air inhaled by a person. bThis estimate of consumption was derived from informal reports from vaping community; 5 ml/day was identified as a high but not rare quantity of consumption and 25 ml/day was the high end of claimed use, though some skepticism was expressed about whether the latter quantity was truly possible. High-quality formal studies to verify these figures do not yet exist but they are consistent with report of Etter (2012). cThe term “VOC” loosely groups together all organic compounds present in aerosol and because the declared ingredients of aerosol are organic compounds, it follows that “VOC are present”. IB is trained in both occupational hygiene and epidemiology and thus is an expert in bring information that these two fields contribute to risk assessment and policy-making. IB does not and never has used any tobacco products. Current research was completed by him as independent research contract during otherwise unpaid summer months. IB is an Associate Professor at Drexel University and felt obliged to disclose his primary academic appointment but this work was completed outside of the structures of Drexel University. The author is thankful to Dr. Carl V Phillips, the CASAA Scientific Director, for frank discussion of relevant scientific matters. The contribution of Charity Curtis, Masters of Public Health student at Drexel University to the initial literature search was greatly appreciated. Lastly, the author is deeply indebted to pre-publication peer review that occurred upon release of the content of this article as technical report -- Burstyn I: Peering through the mist: What does the chemistry of contaminants in electronic cigarettes tell us about health risks? July - August 2013, Drexel University School of Public Health, Philadelphia, PA (http://publichealth.drexel.edu/~/media/files/publichealth/ms08.pdf) – all the feedback is greatly appreciated and the remaining flaws in the report are author’s sole responsibility. Funding for this work was provided by The Consumer Advocates for Smoke-free Alternatives Association (CASAA) Research Fund. CASAA is an all-volunteer, donation-funded, non-profit organization devoted to defending consumer access to and promoting tobacco harm reduction; it is a consumer (not industry) advocacy NGO. For more information, see http://casaa.org/. CASAA exercised no editorial control over the author’s writing or analysis: the author, not the funder, had full control of the content.